Honda CR-Z Mugen RZ: Is this sporty hybrid’s identity crisis over? The Honda CR-Z suffers from an identity crisis. This compact hybrid was meant to channel the minimalism and efficiency of the original Insight and the sportiness of the old CRX, but the result was a compromise: a car that was not very green or sporty. 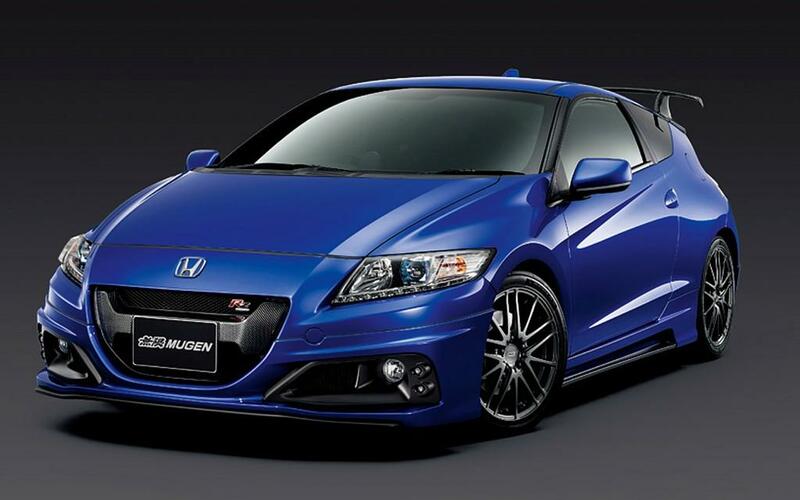 The CR-Z Mugen RZ tries to remedy that duality by just being sporty. Japanese tuner, Mugen, has been working on Hondas since the original CRX hit the streets in the 1980s. Even today ir campaigns a CR-Z in the Japanese Super GT race series, so it was the perfect place to go to give the CR-Z a little attitude. Mugen added a supercharger and cat-back exhaust system to the CR-Z’s 1.5-liter gasoline inline four, giving it a boost of 52 horsepower and 63 pound-feet of torque. That raises total system output from 135 hp and 164 lb-ft to 174 hp and 193 lb-ft. The CR-Z’s claim to fame is that it’s the only hybrid available with a manual transmission. Now, it has the power to make that stick shift worthwhile. Mugen did not say how much that extra power will increase performance, but the CR-Z RZ should improve on the stock car’s 9.6 second 0 to 60 mph time. The CRX’s light weight and compact dimensions made it a veritable go-kart on a twisty road, but burdened with a hybrid powertrain and 21st century safety equipment, the CR-Z is not that lithe. To improve its handling, Mugen added a five-stage adjustable suspension system and an upgraded brake package with larger rotors to the CR-Z RZ. The original CR-Z was never a good looking car; the best way to describe it has always been “unique.” Mugen’s body kit doesn’t really improve the car’s looks, but it does help it stand out more. The front bumper and side skirts have sprouted some random gills and running lights, while a massive spoiler is perched above the rear window. Completing the exterior package are 17-inch forged alloy wheels and 205/45R17 Dunlop Direzza II performance tires. The interior is trimmed in blue and black material to match the exterior. It also matches the exterior in its lack of subtlety; if you don’t like being noticed, this isn’t the car for you. Mugen tried to solve the CR-Z’s identity crisis by turning it from a sporty hybrid to a full-on hot hatchback that just happens to have an electric motor. The RZ’s additions should at least make the CR-Z more fun to drive, but most people won’t have the option to choose this model. Only 300 CR-Z RZs will be made, and all of them will be sold in Japan. If you’re considering making a trip to the Land of the Rising Sun just get one, you might want to look at the price tag. This tuned Honda will sticker for 4,494,000 yen, or about $57,380. In other words, it’s almost twice the cost of a normal CR-Z, which starts at $30,197 in Japan. The CR-Z RZ may be an improvement over the stock CR-Z, but there’s no way someone will spend nearly $60,000 on a small Honda hatchback. Windows 8 Marketplace won't sell games like Grand Theft Auto in the UK, but what about the US?